Unit 24 Lot 66; TOT ID# 1608. 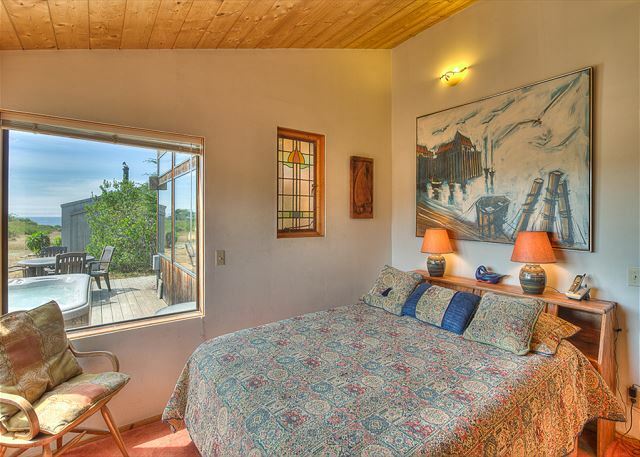 This cozy ocean meadow two bedroom two bath plus loft home. The master bedroom has a queen size bed, guest bedroom has a set of bunk beds with a full size bed on the bottom, twin on top. The loft bedroom also has a queen sized bed. 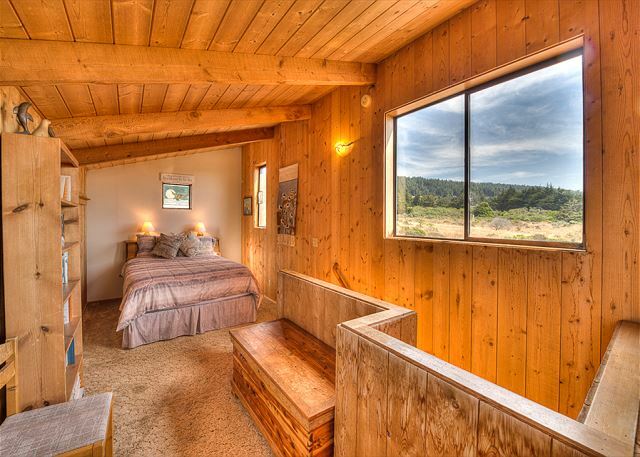 Enjoy a soak in the hot tub or relax on the deck while taking pleasure from the meadow views. Take a short five minute walk to Shell Beach or visit the nearby children's play ground; continue on the Bluff Trail to enjoy the unique Sea Ranch scenic ocean views. Great home for the budget minded family vacation. Dogs welcome. Bed linens and towels are not included with this rental. Excellent stay at Clisham! Cannot wait to go back. This home has everything you need for a flawless stay. The hot tub was perfect! You even get a partial ocean view from the back. Deer galore! This home was spotlessly clean. We'll be back! We have rented this property many times over the last 30 years. It is perfectly located and is the right size for us. I would suggest that the owners purchase a new set of glasses for the guest. There were only two water glasses or else plastic ware was available. As always, very easy check in and check out. The property is a little older and worn, but comfortable and cozy. Look forward to coming back next year! a guest from Saint Helena, CA does not recommend this vacation rental. Hi - would be very nice to have written instructions on how to work the TV system the house has. We missed our favorite news program on Friday at 6:00pm. because had no idea how to get to it. We tried. We like this house, we have been coming here since it was put in the rental program, 20 years ago or more, nothing has been changed, so if the bunk beds could be fixed as two beds would be wonderful. Great location if you bring kids - walking distance to beach, playground, seals, and tide pools. Hot tub big enough for our family of 5. 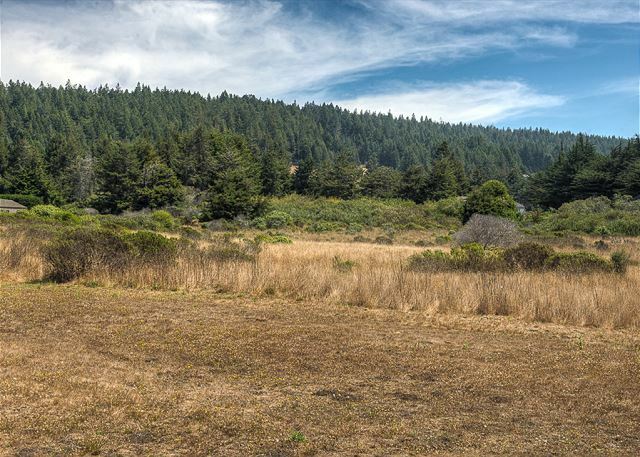 From the deer wandering through the wide open commons area in the back to seals and Shell beach within walking distance, this stay was both relaxing and energizing. The home was a much appreciated comfortable hub for family to gather. It was a wonderful time! We enjoy Sea Ranch very much, and we had a wonderful time. Dianna at Beach Rentals was very thoughtful and accommodating of the issues that came up during our stay. We really appreciated her helpfulness very much. When we checked in the TV cable did not work, Dianna got the owner to install a Roku so that we had some TV. We mentioned a few other maintenance issues that we suggested be fixed before the next guests check in. I have no doubt that they will be fixed. 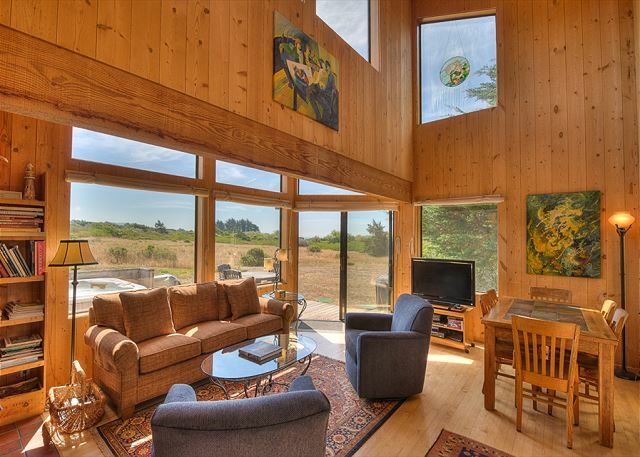 We love Sea Ranch - and the Clisham House enhances the experience even more. Great house, great views. 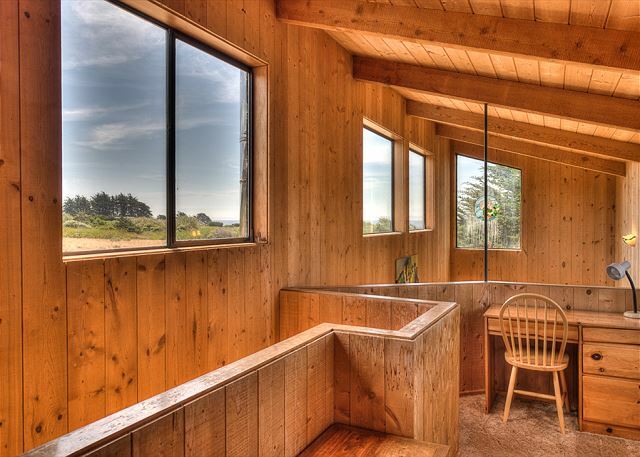 It's just the right size for a couple or small family, the furnishings match the Sea Ranch spirit, you can hear the ocean and it's centrally located to the Lodge and Gualala. And Beach Rentals does a great job. We'll be back! Loved it! Our family loved the location and the quiet and calmness of the property. We enjoyed the hot jaccuzi, local pool, and even got to visit the equestrian center during open house. Great if you want to get away from busy city life and technology. Not too much distractions in town so we were literally limited, fortunately, to only the beautiful elements of nature! We’d surely love to back. We enjoyed a perfect long weekend in the Clisham home. Great location just up the street from 2 incredible beach access locations. One had an awesome group of seals living on the beach to enjoy watching and the other great for sand castles, treasure hunting and reading a good book. The house was very comfortable, furnishings well lived in, but I found all to be pretty clean. Very comfortable home for 6 people. Hot tub was very clean and wonderful to use while star gazing. This home is perfect for a couple with 3 children. One King bedroom with bath, one bunk bedroom and one loft bedroom. Easy access to Shell Beach makes this perfect. We arrived just as the rains started, found Clisham House cozy, well stocked with wood and a great place to listen to and watch the Pineapple Express dump 7 inches of rain on Sea Ranch. Just about the time cabin fever was setting in, the clouds parted and the sun came out in full force. With a view of the meadow, we could watch the wildlife come out to nibble. A short walk to the coast and a view of seals and their pups. We had the best of it all. The rain took out the hot tub but it was repaired quickly and was enjoyed rain and shine. Perfect for four plus dog. A little tight for six. Nicely furnished and good art on the walls. Kitchen utensils and dish ware need upgrading and an empty cupboard would be nice after reading about the raccoons. Our family really enjoyed spending spring break in de ranch this year. We have been up twice before but the Clisham House was much closer to the trails. The team at Sea Ranch Beach Rentals was very helpful and focused on insuring that we had a trouble free stay. Our dogs were also welcomed and felt right at home. We have stayed at the Clisham House several times and always enjoy our time there. The house is a little worn but very comfortable. 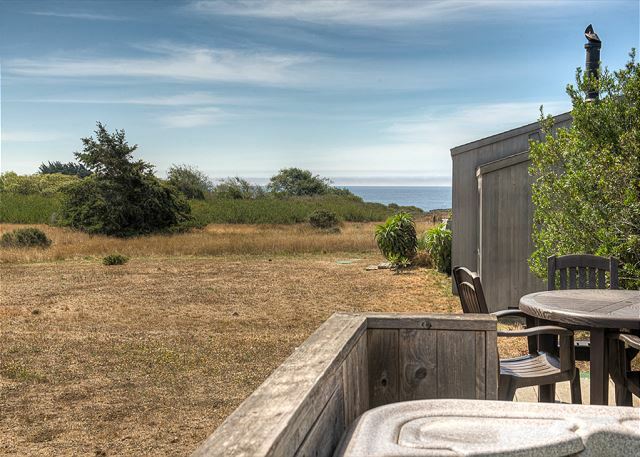 The close proximity to Shell Beach makes it a perfect location. We will be back!! We love staying at Clisham. This was our second stay at this house and our 6th stay at Sea Ranch. We love the cozy feel of the home and the fact that is has everything we need in the kitchen. Some days we were up early for a morning stroll down to the beach with our coffee and some mornings we slept late and curled up by the fire with a book. The hot tub is always a favorite and we love that we can bring our dogs with us for a break away work and school. Starting the New Year here was perfection. There are some quirky things about the house (red heat lamp only in the master bath, for example) but we have come to love them. We'll certainly be back! The people at Sea Ranch Beach Rentals are always a pleasure to work with and we enjoyed using the app this year. It was nice to have the details handy an in one place. Terrific place! We loved our stay at the homey cozy Clisham house. Great views of over the meadow. Wildlife, particularly dear… Many hawks and kites. And the interior is well laid out. Very functional woodstove with tons of excellent firewood. The Art is clearly chosen by individuals who care and the entire home seems well laid out. Very functional woodstove with tons of excellent firewood. The Art is clearly chosen by individuals who care and the entire home seems cared for and kept up. Great hot tub and comfortable beds… We would go again anytime. Great vacation at the Clisham house in December 2017. 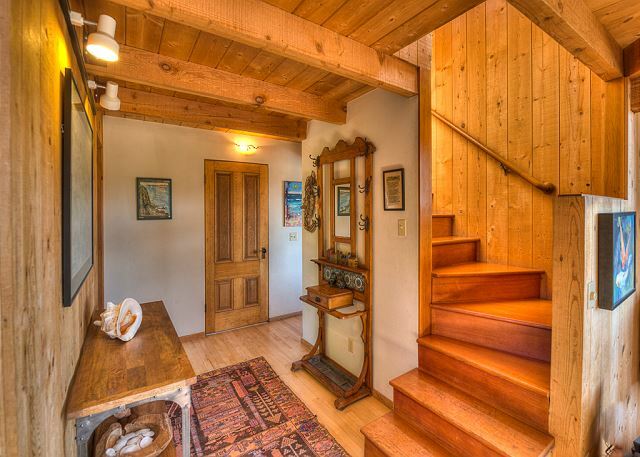 Very cozy, comfortable home with great location to the trails. Clisham is our annual escape. Morning coffee on the deck, sunsets on the beach, it doesn't get better than that! Wonderful and restful and relaxing. The location of the property is perfect to walk in all directions. We had a relaxing time with silence all around. This home is perfect for us and we will rent it again. 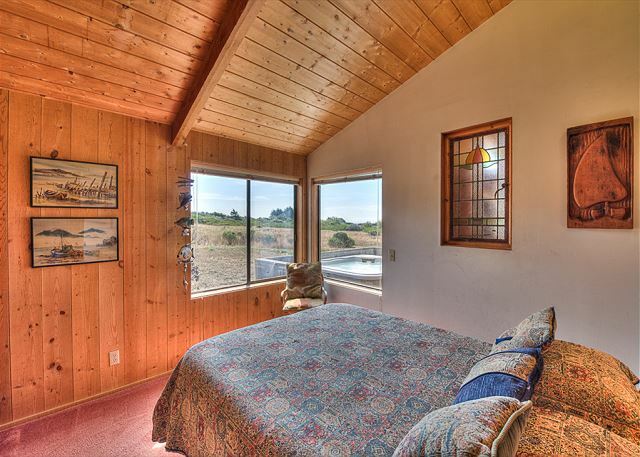 Perfect home for a relaxing stay at Sea Ranch. Clean, beautiful views, comfortable beds, hot tub, short walk to the beach- who could ask for more? Oh, do I love staying at the Clisham home! It is so comfortable, such a happy place to be! Great views, lots of light. Such a great location. I'll be back!! The Clisham House fit our family of 4 plus a dog very well. My son loved sleeping in the upstairs loft, and my daughter was happy in one of the bunk beds. I slept like a baby in the master queen. We loved being just a few minutes walk from both Shell Beach and the bluff trail. We took advantage of the hot tub on the beautiful chilly evenings, and even a few mornings. I gave the 'general condition' 4 stars due to the sliding glass door to the patio sticking and being difficult to lock and unlock. We told the rental company, who was very open to the feedback and may have fixed it by now. All interactions with Sea Ranch Rental were friendly and helpful. My family would be happy to stay here on our next visit to Sea a Ranch! 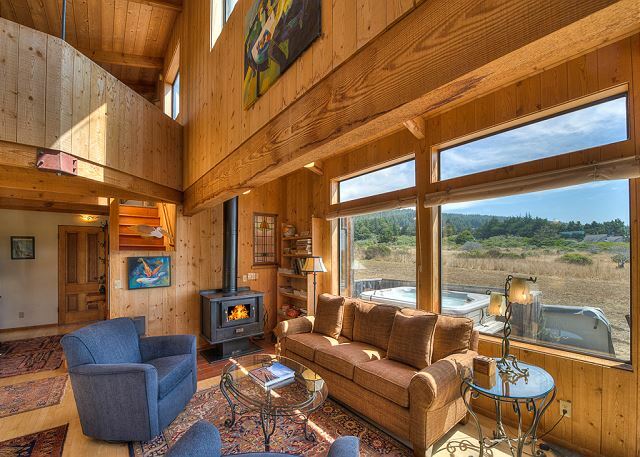 Truly wonderful home at Sea Ranch! My husband, our two small sweet dogs, and I all loved our time at Clisham House. It is warm, friendly, comfortable, and easy. And we could tell the owners really love this home and welcome renters such as us. So we will very gladly stay again as soon as we can! Loved everything about this home. we had a very good time and we enjoyed the house. we saw a lot of deers and a raccoon who came up to the screen door and looked in and left in a hurry. My wife and I stayed here for four nights and loved the place. It's spotlessly clean and has everything you need to cook. Great place for a couple. 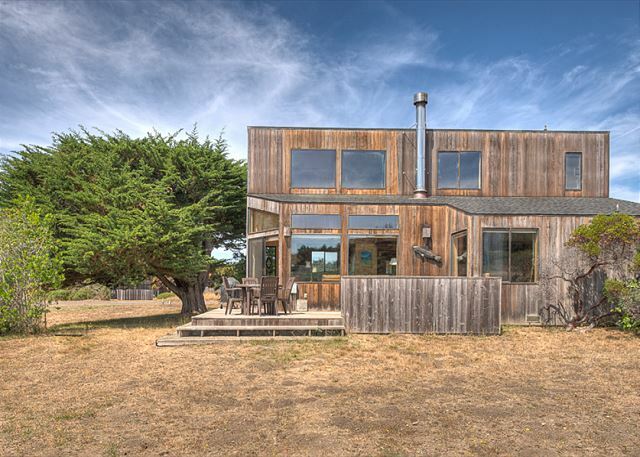 Sea Ranch feels like our home away from home! As a family of 5, this house is one that we come to again & again. It is centrally located & walking distance to our favorite beaches. A few upgrades would be great....the master bed is not very comfortable & many windows are without screens. Nonetheless, we will be returning!! My wife and I came up for an early birthday getaway for myself, but some of our friends wanting in on the celebrating. The Clisham house accommodated everyone beautifully. 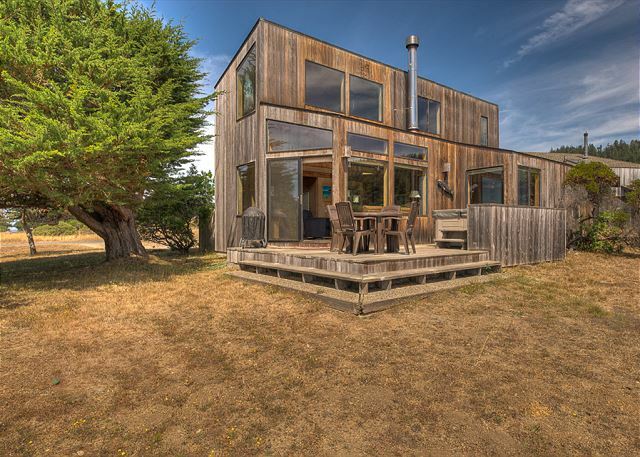 I have been coming to Sea Ranch for years, since I was a kid, and I can confidently say that this house typifies the SR experience. We enjoyed the Clisham house stay greatly. We were a family on four, from 69 years to 30 years of age at a pre thanksgiving get together. The house was well designed and laid out for us. We loved the easy access to trail walking along the edge of the bluff overlooking the water.
. We ate all meals in the house and found the kitchen easy to use. Thank you to the past renters and owners who left spices in the house for renters. For us the walking trails and down time in the house were highlights. We did use the pool which was about a mile and a half away. The pool facility was well maintained and the solar heated water was moderate in temperature. 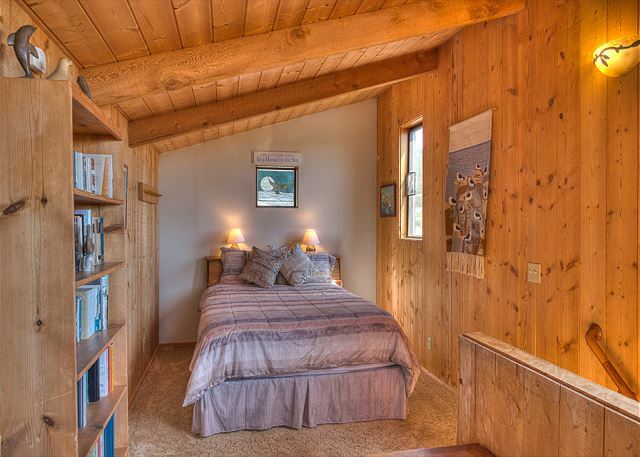 A wonderful cottage for a great getaway/mini vacation. Beautiful light throughout the day. The house is very cozy and comfortable. This has become our coastal get away go to. We are never disappointed. The kitchen is well stocked with everything you need and the hot tub is always sparkling clean. The BBQ has been used so much it could use a new grill - but it was still functional. The raccoons come by every evening and the deer every morning! We love it here. 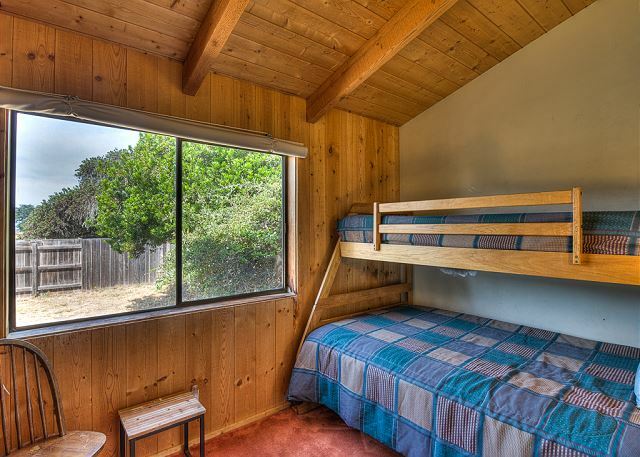 We have been coming to Sea Ranch for the past 30 years and have rented Clisham many, many times specially when our daughter was little (now 24). Love this section of the ranch because it is close to Shell Beach, the play ground, the beach where the seals have their pups. We were back to celebrate our 30th. wedding anniversary. Cute place, great location, needs a little attention. Great location close to the ocean and tide pools. It was clean and bright. Hot tube worked well be puts out a audible hum all the time that detracts from the experience outside. A few other things like the clock that is either not working or needs a new battery, the fluorescent light in the master bedroom not working and a blender not working are minor but give it a little sense of neglect. It would have been nice to have screens on more on the windows and sliding glass doors so that we could have them open for fresh air with the many flies we had to deal with. It would also be good to fix the window in the master. You can follow the instructions to work around the broken crank be it still seems delicate and I had a hard time closing it without feeling like I was going to break it. Overall a good expeirence there there just needs to be a little more attention to detail and maintenance. Our family did our yearly trip to Sea Ranch at this property this year and we were so pleased. It was a great property, very comfortable, and in an amazing location for walking to the beach and the playground. It was a very nice house and a great location. A very good experience. The young lady at the rental office was extremely nice and helpful. The house itself was nice and cozy. The counter top in the kitchen had a lot of oil stains and the one bathroom had no light in the shower area just a red heat lamp, kind of strange. other than that I would stay there again, very comfy. This house was really cozy and homey! I came with three other guests and although this was one of the smaller vacation rentals I've had, the house fit us quite nicely. Our puppy that came with us loved the house too! The loft was super cute, the hot tub was spacious and clean, the kitchen had everything we needed (we cooked all of our meals! ), and the rocking chairs in the living room were AMAZING. I spent a lot of time just lounging around in one of those and rocking myself to sleep! The only con I can really think of was that I wish there were screens on some windows and more updated screens on others, as the loft could get a bit warm and stuffy. But other than that, we all had a great time here. Not to mention, this house was steps away from the beach/bluffs, which we really took advantage of. Great home, great stay, great vacation! 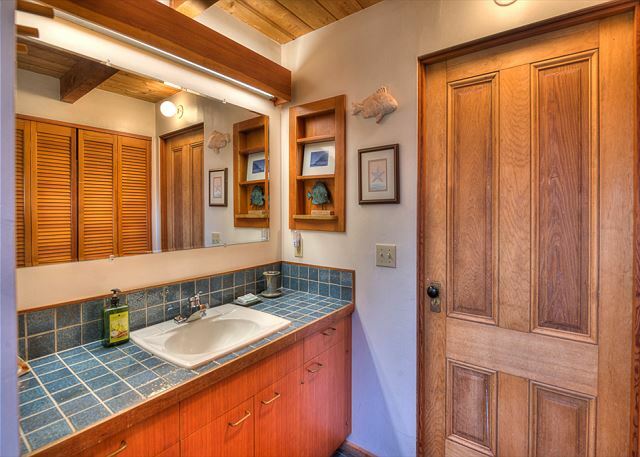 If you've stayed in sea ranch before this home has the older charm familiar from decades past, is clean, has the necessary amenities and is in a great location. May seem dated to a folks with pickier tastes. For us it provided a much needed getaway in a great spot. It's a nice house, but there is only one bedroom that's good for a couple. 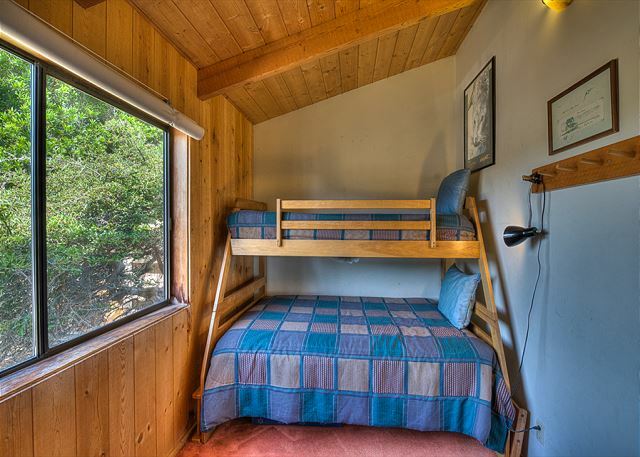 One of the other bedrooms has bunkbeds and the third is a in a big loft upstairs without a closed door. Otherwise, it's great house. A great week in a nice house. Couldn't ask for more. Always a great time at the Ranch! Great house excellent locale. And, a fun time in Point Arena for the 4th celebration! Lynn N from Rancho Cordova, CA does not recommend this vacation rental. We were a group of six; four adults and two children. This was our second trip to Sea Ranch together. This home is well located. 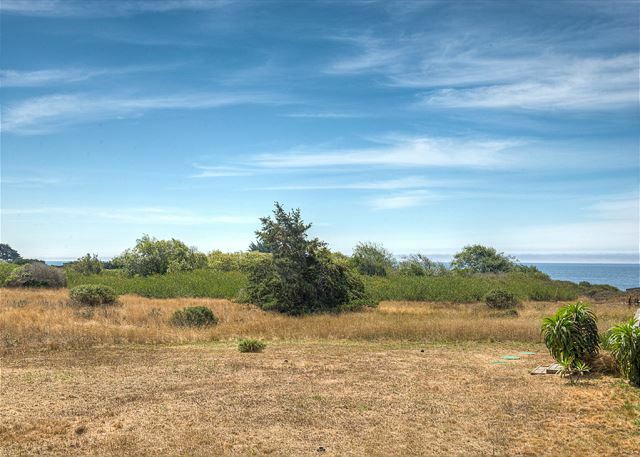 The meadow views are nice and it is a short walk to the beach and bluff trail. There is adequate sleeping space for six, but the living space is small. The kitchen is only big enough for one person at a time and is poorly laid out. The dining area is crowded. 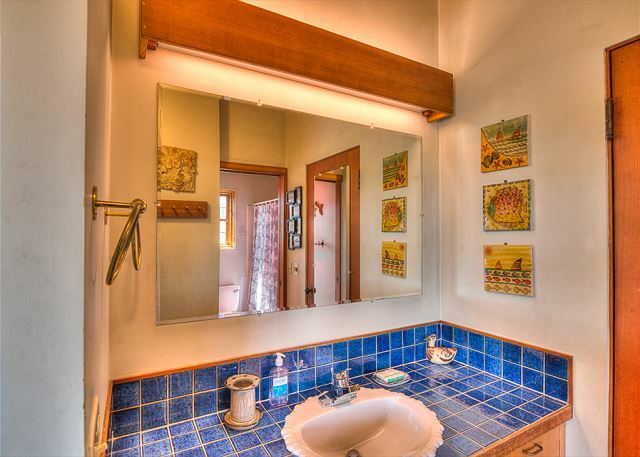 There isn't a light, just a heat lamp, in the tub and toilet area of the master bath. Several of the windows are missing screens. The wood floors and kitchen cabinets need to be refinished. 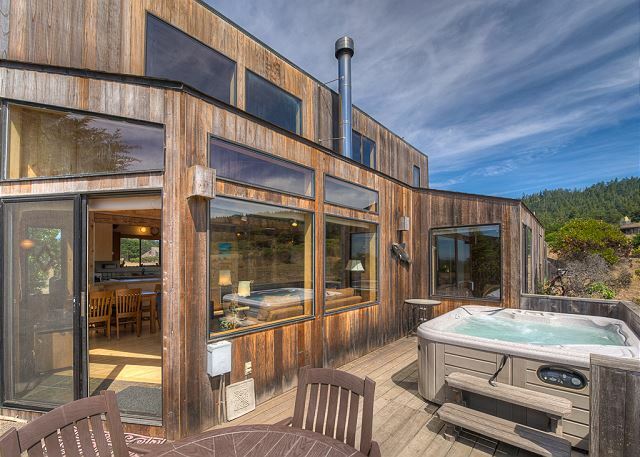 The hot tub was enjoyable and the rental fee is less than many other Sea Ranch homes, but I will book a different house next time. Loved the area, the house, and we had a wonderful time. We had a great time - the house was very comfortable and cozy. Everything was clean and neat. The master bed was very comfortable. A couple of things though - the sliding screen door could be fixed and screen in kitchen fixed. Bugs were getting in. Also, a blind could be installed in kitchen window. I could not take a late afternoon nap on sofa, since the bright sun was shining in. TV remote did not work properly - but WIFI worked great. Overall a great place to stay and very convenient to hiking trails and Shell Beach. I look forward to next visit! This was the perfect house for us because we could bring our dog! Very easy walk to the beach and bluff trails. Close to Gualala which is convenient when you forget something. The mornings were chilly so we were glad for the wood stove which warmed the house up quickly. Great Getaway - nice location! Very good meadow location, gets good sun, decent wind protection, love the hot tub on the deck with views straight over the ocean. Not on the bluff, but about 100 yards back, easy to amble over to watch seals and crashing waves. Nicely equipped with an eclectic variety of books, some games, tons of pots and pans, and basic spices, but missing a few essentials - had to go out to get sea salt and olive oil, but does have pepper and italian seasoning. Comfortable assortment of beds and sitting locations - love the loft and desk. ...and the fireplace cranks out some good heat ( just make sure you pull open the hidden panel beneath the big door and slide open the air inlet vent to get a decent draft going). Cozy, comfortable house a short walk from the beach. Great master bed, great hot tub. A very comfortable home and everything one would need. Loved the personal touches of the painting and stain glass art all around. Great spa hated putting the cover on the deck floor a simple board across the back to just slide it on would be a nicer option like a 4 leg table top. Location, location very nice and dog friendly an extra plus. This has become our home away from home! The house is cozy and quiet - a perfect escape from reality. And dog friendly is a bonus as our toy poodle loves to run with me on the beach. There were even a few new upgrades since we were here last! We had a great relaxing time!! We were attending a wedding at Sea Ranch, and didn't have a lot of time to take advantage of the beautiful scenery and hiking trails. Next Time! This was our 6th stay at Sea Ranch and our first in this home. We love the proximity to Shell Beach. The house, while not fancy, had everything we needed and felt like home. We cooked some great meals and made some great memories. My only issue is with the proximity to the other houses. We were so close that one of neighbors saw that our dog was not on leash--on the deck!-- and called security. When outside, we could also hear others' conversations inside their houses. At a less busy time of year, that might not be an issue. Overall, a very comfortable house and we enjoyed ourselves here! Paperwork processing our trip was a breeze, the rental management was outstanding, helpful and knowledgeable. Our rental located on the meadow was a perfect place for long walks on the bluff and beaches. The condition of the home is a little tired,kitchen cookware and utensils are dated but the charm of the home makes up for it. Would not hesitate to book it again. We really enjoyed Clisham. It's a nice house, on the small side, but perfect for the two of us and two dogs. I think it could handle four adults relatively well, but might be a little cramped. Great wifi. Note that the tv has been upgraded since the pictures were taken, so it's a flat screen. Nice location looking out on a field. Saw plenty of deer, which the dogs got a kick out of. Management company was very easy to work with. Nice little presents waiting for the dogs. Really nice to know that this was truly a dog friendly property. Only two small complaints. It's very close to the houses on either side. We could hear complete conversations from one of the houses - while we were in our living room. Not a big problelm though. And new chairs in the living room would be nice. They are fine but have seen better days. All in all though, it was exactly what we were looking for - a quiet July 4 away from all the fireworks in the city! This home has a great hot tub, great master bed and overlooks a meadow that's a popular deer hangout. It is also a short walk from Shell Beach. I really enjoyed the iPod player/radio, but could not get the Internet or the blender to work. I can live without Internet, but not without a blender. Cheerful and bright, great location! We really enjoyed our stay at Clisham. It was a light, bright, cheerful place with a very pretty meadow view. It was close to the bluff trails and One Eyed Jacks. The only thing we would suggest is to replace the mattress in the downstairs bedroom. It was pretty uncomfortable. Other than, that, we really enjoyed our stay here. We very much enjoyed our stay at the Clisham house. Super small walk to the beach and nice view of the ocen from the deck. Tons of natural light and very cozy home. We'll be back for sure! Love Sea Ranch! Wonderful get away from the hustle and bustle. 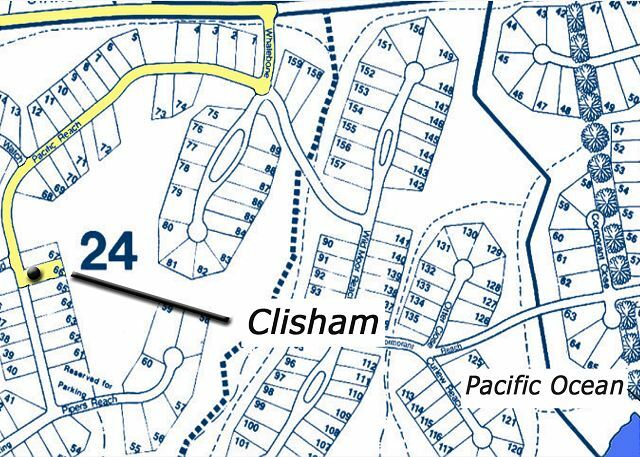 Beach Rentals was easy to deal with; Clisham rental was very dog and family friendly. Loved the up to date/clean hot tub on the deck. Kitchen was stocked with what we needed. Cozy and comfortable home. Windows were sparkling clean, very appreciated, before the rains came down. Weather was perfect for our early April stay; curious to know if the home gets too hot when there's no fog in the warmer months. Saw a harbor seal pup an hour after being born, 5 minutes walk away from our rental, and Sea Ranch docents on hand to tell us more about the pupping season through Memorial Day. There's always lots to do at/near Sea Ranch. Great place to vacation if you like the ocean, walks along the bluffs, beach combing and exploring remote environs. Great location, house was comfortable, could use updating (carpets in bedrooms, kitchen). We will probable be back. I loved our stay at the Clisham House because of its location,comfortable furnishings and general "down home" feel. It was fully stocked with all cooking utensils. What a wonderful week! It does get a little cold in some of the back bedrooms, but we used the plug in electric heater. We had a great time - rain and all!!! Thanks Clisham's for sharing your place with us. The new dining room table's a nice touch!! We loved our stay at Clisham. The location was great in that we were close to the beach, walking trails and the town of Gualala. We were thankful to bring our dogs, who also enjoyed there stay. 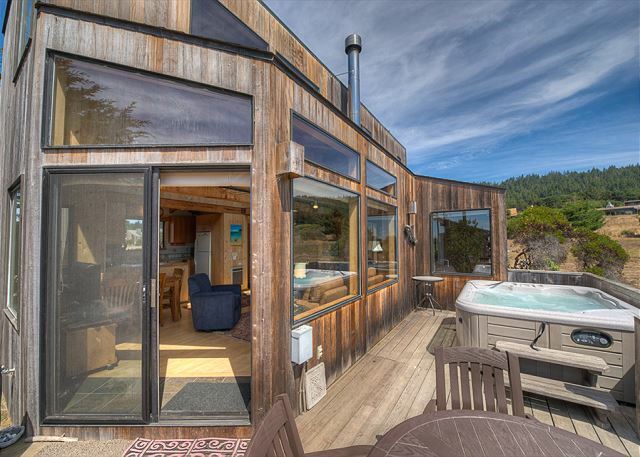 Sea Ranch is an incredible location for a relaxing vacation. Very quiet and peaceful. Didn't have to get in my car at all; walked everywhere. Beaches and hillside trails and Chapel all close . The layout of the house is great for everyone to be close but have some privacy. The decor is very comfortable and we had room for guests for dinner. The place was clean, except for the coffee table and side table had not been cleaned...messy sticky rings! My kids arrived first and thought it was etched in. But it cleaned up with glass cleaner. It was so sweet to find a sheet and towel for our dog Derby. Very thoughtful. We would rent again for sure. Its was pleasant stay. Close to the beach and Gualala to do our grocery. 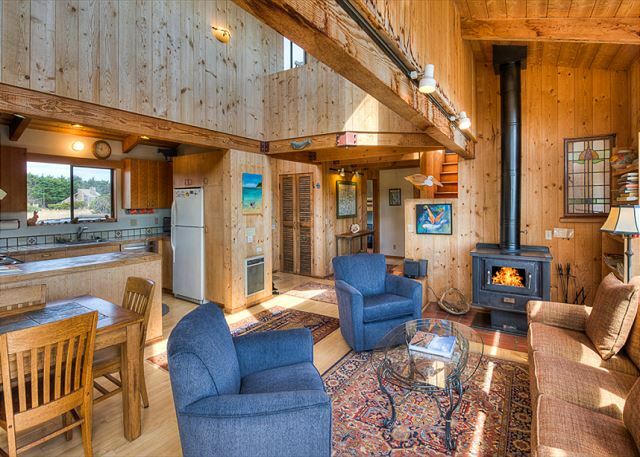 Short walk to beach, comfy living room with woodstove and very nice hot tub. Short on kitchen items, but iPod player and wireless Internet were a nice surprise. Great location to bluff trails and beaches. Kitchen was adequate--could use a good cleaning, especially the cupboards and appliance door handles. Would be nice to have a teapot and toaster oven and a non-stick pan. This is a good place for someone who does not require all the amenities of a primary residence. 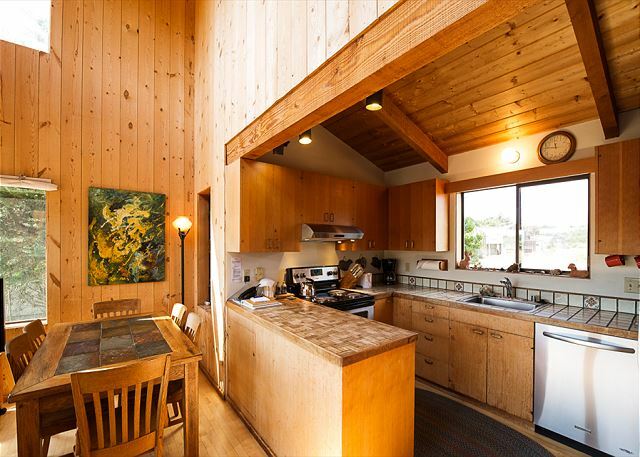 We like the "original model" of the Sea Ranch house which is more cabin-like than the larger McMansions that typify some of the more recently built Sea Ranch houses. Had a great time spending Christmas here. The house was very comfortable and in a nice location. The kitchen could really really really use an update, especially the stove/oven, and countertops. We really enjoyed our stay. My teen-aged son loved the loft. The house was a perfect fit for our family (2 kids and 2 dogs) and we will be coming back! My friend and I stayed for a few days, and we loved the property. Very clean, comfortable, and wonderful to be so close to Shell Beach. It was the perfect spot! We loved Sea Ranch and will definitely return. The views were amazing and the air was fresh and restorative, just what we needed. We were particularly grateful that someone left a light on and the hottub ready for our late arrival Friday night. And special thanks to the friendly and helpful lady at the Sea Ranch rental office on Saturday afternoon who helped me find medicine for my sick baby! Update the tv and replace the broken chairs and you'll get our vote for a return. Easy beach and bluff walk access, great hot tub, well equipped kitchen. This was our third time at Clisham - we consider it 'our' place. We always have a great time - the house has everything we need for our time away. We'll be back!!! Our stay at Clisham house was wonderful. The location was perfect. The walk to Shell Beach, which was less than two minutes. It was by far our favorite, complete with seals, tidepools, sandy beaches. We could see the ocean from the hot tub. The house was charming and housed a wonderful library. It warmly decorated and perfect for our family. They have thought of everything for your comfort and entertainment. I would highly recommend this home. We enjoyed good weather in May, a conveniently located home with comfort for our children to visit and for the grandchildren to enjoy a day at the beach....close walking for little ones and nice quiet walks for us older folks. This is the perfect spot to unwind! The beach is so close - but it was also nice to sit in the hot tub and watch the waves!! Great little house with the right amenities. My partner and I took our four children. It was a great size for 6. Plenty of room for everyone. Great and convenient location to the beach and the park. Clean and much better than the photos suggest. We all had a wonderful time and will book this rental again! Even with rainy weather , our abalone group of 4 stayed dry and happy during our stay, house was just the right size for 4 middle age juveniles, played pedro, shared a few cocktails,watched the wildlife,great relaxation. Everything was great, and although the keys weren't there when we got to town, your staff was right on it and got there quickly to get us the keys! We've rented with you before and will rent again in the future. 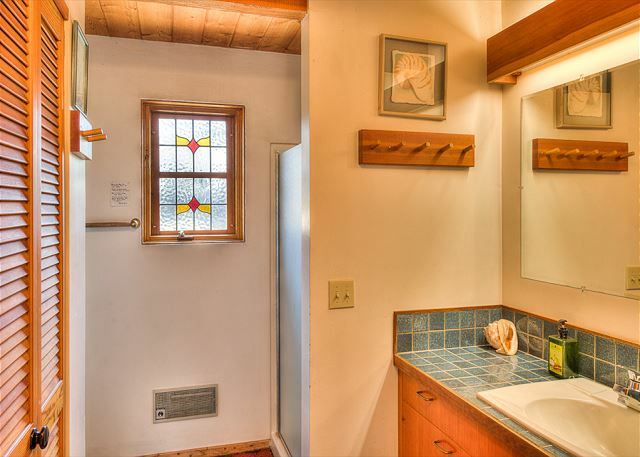 I would suggest that the owner's get a shade for the kitchen window though; that afternoon sun is brutal on the eyes. We have stayed at this house several times over the past 20+ years. The cost is reasonable, its a great location, it is the right size for a family of 4, and we like the layout. Great place to relax and enjoy. Home well furnished with amenities. Easy walk to beach, saw deer. a fox, many birds.